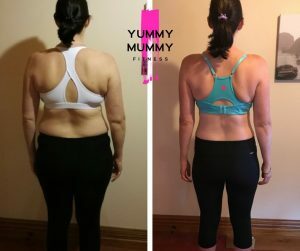 Leyna first started with YummyMummy in 2015 and achieved amazing results! 2 years later, shortly after having baby number 3 Leyna decided to come back to YummyMummy for another Shape Up to regain her pre baby body. Starting at 92.1kg and feeling very uncomfortable in her body, she knew that she could get back into great shape and knowing this kept her motivation high throughout 2 back to back 8 Week Shape Ups during which she lost 15kg and smashed her fitness & strength goals. Leyna we think you look incredible and are so so proud of you and have loved being part of your journey to regaining your body! Thank you for inspiring so many others along the way!